We have finally come to the end of the alphabet with a Zither. Also called “Mandolin Guitar-Harp.” It was made by the Home Education Company in Concord North Carolina. It was patented in 1894 and has 28 double strings (14 sets of double strings) and 16 single strings. It is missing one set of double strings. 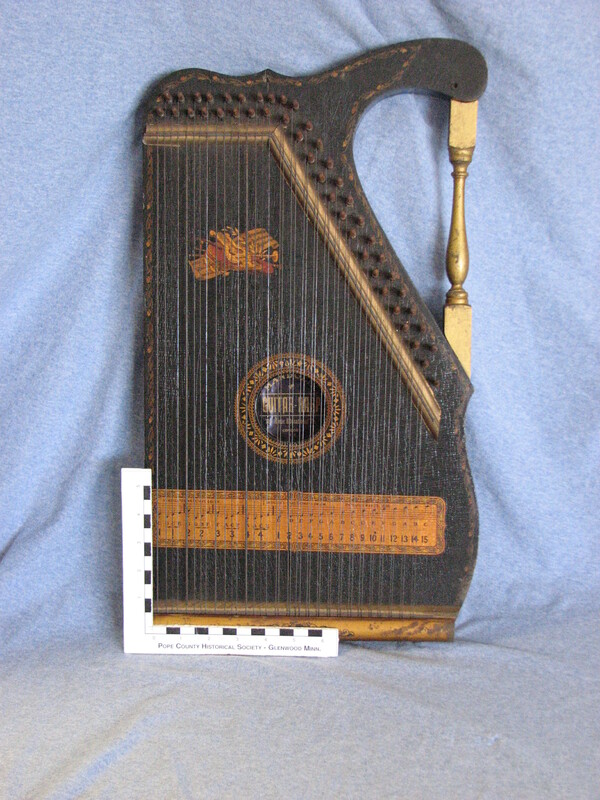 The instrument is painted black with a gold handle. It is decorated with a delicate floral motif around the outer edge and the sound hole. There is also a decoration on the soundboard – it is the image of a lyre, a mandolin, 2 horns, sheet music and laurel leaves. Near the bottom of the instrument there is a chart, placed under the strings to let the player know which notes correspond to the strings. The strings are metal and attached to metal pegs along the top edge. These pegs can be tuned to tune the strings. The rest of the instrument is wood. This entry was posted in Collection Notes, Museum updates and tagged A-Z, Guitar-harp, museum collection, Pope County Minnesota, Pope County Museum, Zither. Bookmark the permalink.